The challenge began last summer at the Utopia conference in Nashville, Tennessee. My roommate and friend, author KT Webb, came up with the idea of publishing an anthology of short stories each ending with the same line. Immediately, I was game, and several months later, nine other authors were on board. "From now on, I'll save myself" was selected as the final line and dystopian the genre. Dystopian? It's defined as relating to or denoting an imagined place or state in which everything is unpleasant or bad, typically a totalitarian or environmentally degraded one. I'd never thought of writing in this genre before and didn't know where to begin. I almost bowed out, but I decided to step up. And before I knew it, I had a whole trilogy outlined in my spiral notebook. My question was taken from my favorite John Lennon song: "Imagine." In his imagining, Lennon's world would live as one in utopia. But what if a world without race or religion was instead dystopia? For pages and pages, I scribbled out a world of no race and religion. I mapped out what the people would look like, how they'd work, how they'd live, how they'd interact, how they'd love. This dystopian world didn't just come into being. There had to be something or someone who served as a catalyst. This new society had to be the answer to a historical problem. And what was initially a solution has now gone all wrong. My heroine, Hope, is fine maintaining status quo until something happens to disrupt her thinking and motivates her to bring about change. There must be opposition. Typically in dystopian stories, the villain is the government or someone or something in power. After doing all of this, let the writing begin. Check out the beginning to my dystopian journey in the story "Something Old" in From Now On: The Last Words Anthology. According to new research at Stanford University, children as young as 24 months pick up a lot of grammar basics. Previous research has shown they are able to use articles, such as "a" and "the," early and correctly. But it's not certain whether toddlers are imitating adults are truly understand the differences. Researchers argue whether such grammar development is innate or learned. More research is needed. There will be an app for that. Matthew Frank, associate professor of psychology at Stanford University, and his colleagues are developing an online database, Wordbank, to gather data on children's vocabulary and early language development. Frank is also collaborating on a smartphone app to collect early vocabulary data from parents. Read. I'm sure you've heard this at least once before: Good writers read. Well, it's true. Ask any successful author what books he or she has read, and I promise the list will be ridiculously extensive. As the great Stephen King once stated: "If you don't have time to read, you don't have the time (or the tools) to write. Simple as that." Books, articles, reports open you to worlds you may never have the resources to physically travel to, professions you may never have the time to earn degrees for, and people and cultures you may never encounter in your daily walk. Our lives and experiences are enriched through reading. And what if you're reading this and don't consider yourself a writer? Reading is still paramount. Yes, Purple Inked is here to help you with grammar rules, punctuation marks, and different writing techniques. But you have to do the reading to master the words. So tell us, what are you currently reading? I've been known to hit up a Dunkin Donuts occasionally. And I can't resist any opportunity to go to Duck Donuts. But you will never catch me eating a donut, and neither should you. Traditionally, a donut is a type of metal gasket. Through the years, however, this spelling has been used in reference to those magical dried dough treats being honored today. According to Merriam Webster, the variant donut has been used "in published, edited text since the mid-20th century." Many dictionaries accept it. Yet the Associated Press and I still uses doughnut. When I set up my online dating profile years ago, a friend of mine called me an elitist for stating I would not correspond with someone who used bad grammar. And after months of ignoring messages with misspellings and misuses of homophones, I began to wonder if she was right. Thanks to two new studies, however, I've learned that I'm not the only one who squirms when asked "How U doin?" (especially when the sender looks nothing like Joey Tribbiani) or told "Luv two meet U." Sensitivity to spelling errors and grammatical mistakes appear to be common for those with my personality type. According to The Guardian writer David Shariatmadari, "Introverts, it turns out, are more likely to get annoyed at both typos and grammos." Grammos, he explained in a recent article, are "errors involving knowledge of the rules of language." In the same article, Shariatmadari details the findings of a study done by linguists Julie Boland and Robin Queen. For the study, eighty Americans from different backgrounds, genders, and ages were asked to react to emails responding to an ad for a roommate---some with errors and some written perfectly. They then had to fill out questionnaires on their personalities. The findings revealed that the introverts and conscientious people saw typos as a problem and scored the emails with errors as those coming from potentially bad roommates. But us introverts aren't the only ones who don't want to cohabitate with error-rich writers. According to a survey done by dating site Zoosk, grammar is also incredibly important to millennials in digital dating. As explained in a Salon article about the Zoosk survey, "People don't want to share their thoughts with someone who can't articulate theirs." Many surveyed related had grammar to laziness and apathy, and I agree. Always make the effort! Although I am currently not seeking a roommate and have deactivated my dating profile, it's nice to know that I'm not so elite in my desire for well-written communication no matter the medium. And somewhere out there, I hope my future husband and one day permanent housemate os taking note with a copy of Strunk's Elements of Style in hand. One of the best investments I made in 2015 was in Danny Rubin's book Wait, How Do I Write This Email? Although I've well missed the cutoff to be considered a millennial, the generation of Rubin's target audience, I am still young at heart. And this book is chock-full of invaluable templates for professionals of any age and stage. Months into 2016, I am still regularly turning to it for assistance in crafting nearly every business correspondence. Believing that great writing skills can be the key to career success for many, Rubin has spent several years teaching millennials the power of strong writing and networking skills through workshops and his blog, News To Live By. Additionally, his first book, 25 Things Every Young Professional Should Know by Age 25, provides a comprehensive list of leadership skills and tips every millennial should know to be successful in the business world. He is, in my opinion, a communications champion and guardian of the written word for this generation. For the rest of us who can only visualize twentysomething from our rearview mirrors when we squint, Rubin's lessons are still very applicable. In more than 200 pages, Wait, How Do I Write This Email? covers writing emails, business letters, resumes, and so much more. There are tons of books out there for purchase that promise to help you build a better vocabulary in a month, and I'm sure they hold true to their words. I love books like these. But before you go loading up at your local Barnes and Noble or ordering through Amazon.com, try using what you already have in your arsenal: words you already know. I know you're already pretty darn smart, and I'll bet you already have quite a substantial vocabulary filled with words you've most likely even forgotten you know. So let's use them. I once had an instructor teach me this simple word game to help me build my Spanish vocabulary. When I did it for a few minutes daily, my confidence grew tremendously as I realized there were a lot of words I already knew, and I was able to learn and remember new ones. Pick a word, any word. We'll start with PURPLE. Now, think of a word that starts with the second letter of the first word you selected. We'll use UBIQUITOUS. To continue, keep coming up with words that begin with the second letter of the previous word. I recommend playing for five words or more if you have the time. Make the first word one you aren't familiar with and research its definition before you play. This way, you are adding words to your arsenal and familiarizing yourself with what you already know. So now that you get the idea, try playing each way for a week or two and let me know what you think. March 4 is like New Year's Day. Several weeks ago, we welcomed in 2016 with laundry lists of resolutions, goals, and declarations, all while unloading our bank accounts for gym memberships and Hello Fresh subscriptions. And while many have already given up, fallen back into old habits, become MIA at 5:30 a.m. spin class, and grown stale to the idea of fresh produce delivery (although my father continues to rave about his subscription); there's still hope. Start anew this National Grammar Day. Pledge to speak better, write better, and overall, communicate better. Purple Inked wants to help. 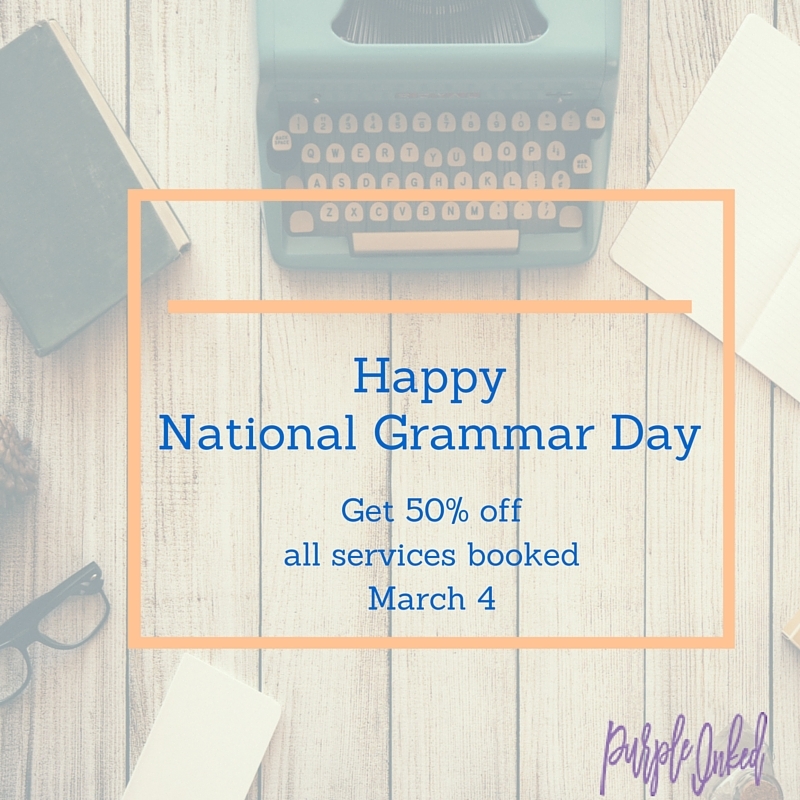 For March 4 only, all services scheduled will be 50 percent off. This means you can start off right with that email, press release, pitch letter, blog post, or manuscript, and save a bundle. Starting today, vow to improve your grammar with these tips and Purple Inked. As a corporate communicator, I've stumbled across and corrected this more often than you can imagine. Executives want to sound eloquent and authoritative in their messaging to their reports. Newsletter writers want to sound interesting and knowledgeable. They brave the use of compound modifiers to exert their writing mastery but fail sophistication by following adverbs ending in "ly" with a hyphen. According to The Chicago Manual of Style and other writing manuals, compound modifiers before a noun are not hyphenated when they are proper nouns or compounds formed by an adverb ending in ly. Compound modifiers, or phrasal adjectives, are hyphenated for readability and clarity. However, this is unnecessary with adverbs ending in ly. As stated in The Chicago Manual of Style, "the ly ending with adverbs signals to the reader that the next word will be another modifier, not a noun." So, kid-friendly and family-oriented events should be hyphenated, but you'll never have a smartly dressed novel with a hyphen. Make sense? Is he just not that into you or punctuation? For eons, editors have told cautionary tales of missing and misused punctuation to an undaunted public. Examples of how omitting commas can turn one toward cannibalism and threaten the lives of grandmothers throughout the nation have made the rounds on Facebook. Yet while many have liked and laughed at such memes, very few have taken action. Naw. He apparently had just missed a few language arts classes in middle school and was stuck at work, (spoiler alert) tattooing Liza's daughter. Confused? Check out the show, and it will all make sense. Pick up a punctuation book, such as Eats, Shoots & Leaves, and you'll never confuse others with poorly punctuated texts and messages. And who knows, we may be able to save a few grandmas in the process.